James Kuether, author of These Amazing Dinosaurs: An Illustrated Journey Through the Mesozoic Era, shares with us about the beginning of his love for dinosaurs. You know the one. Obsessed with dinosaurs at an early age, my parents would trot me out in front of visiting relatives to show off my ability to rattle off the incomprehensible multi-syllabic names of these long-dead animals. I remember my Aunt Dorinne oohing and aahing with mock bravado. I was embarrassed to death, proud of my taxonomic and etymological mastery, but ashamed by the dismissiveness of something she found childish and trite. As an adult, I still struggle with the perception that dinosaurs are child’s things. I can’t count how many friends have come up to me in the past year and said, “I hear you’re writing children’s books!” In many ways it’s understandable. 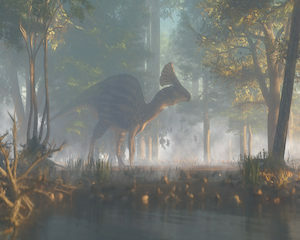 Dinosaurs are introduced to us at an early age, and they are arguably the perfect blend of fantasy and the natural world. In most school curriculums, dinosaurs are taught in the second grade; however, with the advent of popular movies like Jurassic Park and the more recent Jurassic World, by this age most kids have had years of exposure to the velociraptor and the T-rex. By the time kids reach adolescence… well, let’s just say that childlike sense of wonder is replaced with other interests. But for many, the fascination creeps back in at some point. Maybe it’s because we develop a different kind of appreciation for the magnificent beasts as we grow older. Instead of childlike wonder, there’s informed amazement that something like dinosaurs really existed. We become intrigued with the seemingly random process of fossilization, and what leads to some organisms being preserved while others aren’t. The vast majority of the visitors to my websites and online galleries are adults (and, by the way, a large percentage are women), eager and excited to explore the “what if” of how these animals lived and looked. For many, the hard science behind my imagery is the fascination. For some, there seems to be a bit of nostalgia for the innocence they felt as a child, as well as a sense of joy at recapturing the excitement they felt back then. Personally, I think it’s great that dinosaurs are associated with childhood, and if my friends want to think of The Amazing World of Dinosaurs as a children’s book, that’s just fine. Regardless of our ages, we’re all just wide-eyed kids when it comes to dinosaurs. 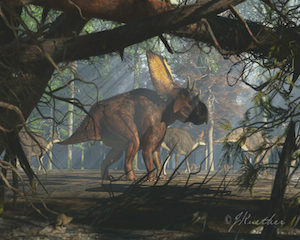 Dinosaur Fact: In 1966 there were less than 200 named species of dinosaurs. Today, there are more than 1,000! If you, too, are intrigued by these incredible creatures, check out These Amazing Dinosaurs: An Illustrated Journey Through the Mesozoic Era by James Kuether, and let The Amazing World of Dinosaurs guide you through this incredible time in history.